New video shares powerful stories about how vaping helps smokers quit. To hear the mainstream media lately, you’d probably be inclined to believe that vaping is an epidemic sweeping the nation like cigarettes did years ago. The FDA is rattling its saber about flavor bans and “teen vaping epidemics”, while dubious news stories talk about popcorn lung and deadly metals – making vaping seem every bit as dangerous as traditional tobacco cigarettes. But if you dig beneath the headlines and propaganda, if you speak with actual vapers, you’ll hear a far different story. 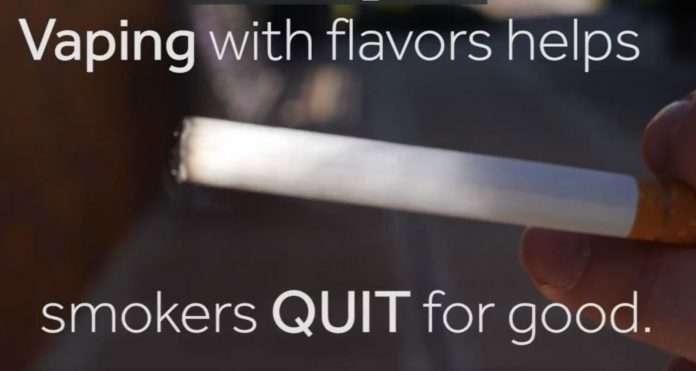 That was the motivation behind this new video from the Tennessee Smoke Free Association – wherein a group of vapers tell us how vaping flavored vape juice has allowed them to give up cigarettes for years. Watch and listen as one individual after another explains how vaping has saved their life, improved their health, and freed them from the harmful shackle of cigarettes. It’s inspiring. If you’re a smoker and feel like you can never break free of the grip of big tobacco, this video should give you hope – if these people did it, you can do it too. Spread the Truth and Change the World. That being said, with the FDA and other regulatory agencies attempting to throttle the vaping industry with endless regulations, flavor bans, and other nefarious plans, now’s the time to fight to save vaping. Vaping saves smokers – and these folks are just a few of the millions of people who have found a way to live a better, healthier, smoke-free life through vaping. Check out the video below, and be sure to swing by our News page for even more information about how you can get involved in the fight to save vaping.